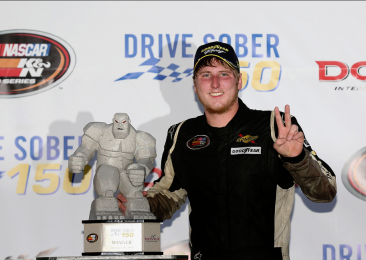 2014 NASCAR NEXT inductee Austin Hill will continue his climb through the racing ranks, after an exclusive announcement to Race Chaser Online Thursday evening that he will be competing in the NASCAR Camping World Truck Series season opener at Daytona International Speedway for Empire Racing. Hill, who will also compete in this weekend’s ARCA Racing Series event at the World Center of Racing, will make his third career Truck Series start (he ran two events during the 2014 season) with backing from the Sean Corr-led team. “Next Friday, Austin Hill will be running one of trucks down here at Daytona,” team co-owner Corr explained on the Stock Car Steel/SRI Motorsports Show. Corr also revealed that the team has plans following Speedweeks as well. Corr, racing as a teammate to Hill in the ARCA event this weekend, is ecstatic to be able to work alongside the young gun and help him advance to the next level in motorsports. And despite it being his debut on the high banks, Corr thinks Hill, who has three NASCAR K&N Pro Series East victories, has a legitimate shot to win in the ARCA race on Saturday evening. Along with racing for Empire in the ARCA event this weekend, Hill will also compete at New Smyrna Speedway in the NASCAR K&N Pro Series East on Sunday evening – the series he will run full-time in during the 2015 season.